Get Creative – Grow right out of the soil bag! When it comes to growing veggies, flowers and seedlings, why not grow them right out of the soil bag? Take a large bag of potting soil mix. Handle the bag and break up the soil within as much as possible. Place the bag on the greenhouse floor or bench. Slice the top of the bag off, leaving about a 4″ border around the top of the bag. Break up the soil and loosen it as much as possible. Punch several holes on the back side of the bag to allow for good drainage. Now you are ready to begin planting seeds into the soil bag. 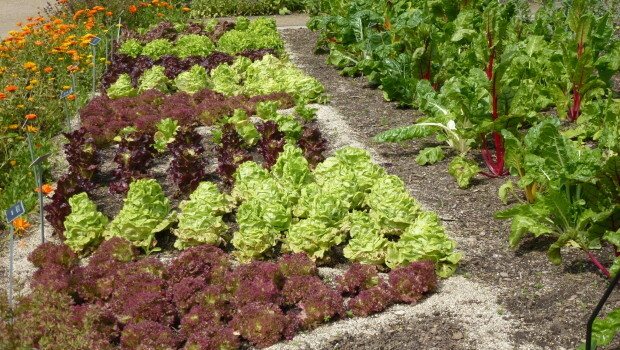 It is ideal to plant spinach, herbs, lettuce and even radishes into the soil bag. Be sure to follow the directions for seeds on the seed packet. Care and water as instructed on the seed package. Note: When your crops are ready to be picked, do not take the pluck the plants right out of the bag. Instead, cut off the spinach, lettuce and herbs, and then watch as they re-grow…you’ll have continuous salad greens all summer long! If you don’t have a greenhouse, or prefer to garden outdoors in summer months, then you can place the grow bag on a table top. Wire top is best to allow for drainage. It also saves your back, as you don’t have to bend down to the ground to work on your plants. Some shading will likely be required, as spinach and lettuce are cold crops and will burn on hot sunny days. Check around your garage and shed. What else do you have that could be used to house your garden…some people have used small kiddie pools that are no longer in use. Reusable bags, old boots, wheelbarrows and just about any other container you can think of will also work for these types of crops.